Report on the 22nd annual wine tasting presented by the Family Winemakers of California (FWC), on Sunday, September 9th and Monday, September 10th 2012, at Fort Mason in San Francisco. The event focuses on current releases and soon-to-be-released wines from FWC members. The two-day event included a brief trade/media tasting followed by a public tasting on Sunday afternoon, and a trade/media tasting on Monday afternoon. 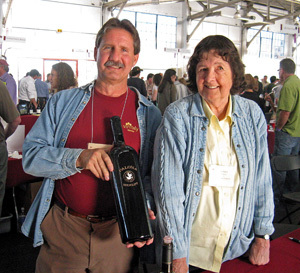 The Family Winemakers of California organization is a statewide trade association that was founded in 1991. From their mission statement, the FWC "advocates the rights and interests of its members to freely produce, market and sell their products, and is dedicated to preserving the diversity of California wine.” The organization works to influence public policy affecting wine producers in the state – they have been particularly active in trying to reform direct shipping laws. There are currently about 550 FWC members, most of which are smaller, family-owned wineries. 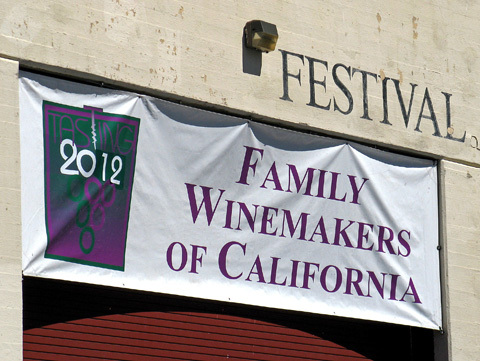 FWC hosts three annual wine-tasting events, one in San Francisco, one in the Los Angeles area, and one in San Diego. 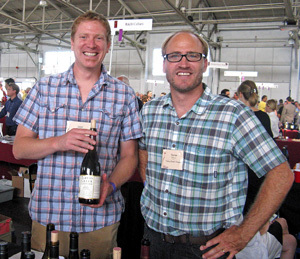 The San Francisco FWC tasting is an enormous event – over 265 wineries were represented in 2012, and this is probably the largest annual tasting of California wines anywhere. With over 35 of these wineries pouring at this event for the first time, it’s a fine opportunity to check out some undiscovered vintners. In addition to the current releases and previews of soon-to-be-released wines, a few wineries generously poured library wines as well. Both the breadth and overall quality of producers participating here makes this the best all-around wine event in the San Francisco Bay Area. Not only do consumers get a chance to taste wines from all over the state and from dozens of grape varieties as well as interesting blends, but a number of top-notch producers who routinely pour at the FWC tasting are rarely seen at other public events. And for the wineries, this tasting probably draws more key wine trade attendees than any other event. I was able to attend both days of the event again this year. As is always the case, the crowds were larger on Sunday, when the public tasting took place, and the large pavilion at Fort Mason was crowded although it was not completely packed. It was not difficult to step right up to most tables, and I noticed only a small number of producers that generated big crowds. Monday’s trade/media tasting was less crowded but still drew a good number of people. Food tables were spread throughout the hall offering bread, crackers, and cubes of cheese, while a few other food purveyors were scattered among the winery tables. The FWC tasting continues to be a very well-run event and things went smoothly throughout, even down to the small details. This was the second year of take-away wine sales at the event. This allowed tasters to purchase wine right at the tasting and take it home with them, a great convenience for the public and an opportunity for wineries to gain new customers right on the spot. The number of wineries participating in the take-away sales increased this year, and I imagine that this trend will continue in the future. Something new this year was the “iSip Wine Lounge” – a Sunday afternoon invitation-only tasting located in the mezzanine level at the rear of Fort Mason’s Festival Hall. Put together by sommelier Courtney Cochran, the iSip tasting featured single bottlings from a variety of producers paired with some interesting and delicious cheeses. I understand that the wine line-up on display there changed over the course of the afternoon, but the intent was to showcase some wine varieties that are not among California’s best-known – I tasted a Roussanne, Grenache, Barbera, Cabernet Franc, and Tempranillo there. I got the sense that the execution of the iSip Wine Lounge concept still needs a little work but it seems like a promising idea that I’d like to see continued in the future. Grape-Nutz colleague Al Osterheld tasted with me on Sunday, while I was on my own for the Monday tasting. For my overall tasting strategy, I did not try to taste whites and Rosés separately from reds, but I did make an effort to taste lighter reds on Sunday and bigger ones on Monday. I didn’t always strictly keep to this system, but by and large I stuck to it. I’d spent quite awhile studying the tasting information that was available on the FWC website in advance of the tasting – they do a great job of organizing this information in a way that makes planning a tasting strategy easy. I had listed a number of producers I’d hoped to visit this year, but there’s never enough time to taste at every winery table I would have liked to. As with last year, I made more of an effort to check out wineries that were either new to me or that I’d not tried in many years – at this year’s tasting, those producers represented about 30% of the tables at which I tasted. I also made a point of tasting more wines made from “off-beat” California grape varieties, including Aligoté, Grüner Veltliner, Vermentino (three of them! ), Lagrein, Mondeuse, Montepulciano, Nero d’Avola, and Sagrantino. There seems to be more interest than ever in exploring some of the state’s lesser-known grapes in a more serious way, and I thought the FWC tasting presented a great opportunity to taste them alongside better-known varieties. Al and I passed on tasting at a few notable wineries whose wines we had tasted in the past few months. With other producers where we had tasted earlier this year, we tried to stick with wines we hadn’t tried before. Still, there were a few “repeat” wines, and we also found that a few wines at this year’s event were the same ones poured last year – including two included in the list of Favorites. There were some favorite producers from last year who did not pour this year – Cartograph, Littorai, and Mount Eden among others. But helping to balance that were several FWC regulars who were not present last year but poured again this year. I also noticed some wineries poured only on Sunday and were not present for the Monday tasting. The unusually late date for this year’s tasting – it’s normally held in late August – may have been a factor, as harvest and crush had already started for many wineries by the time of the event this year. Al and I tasted current release vintages ranging from 2006 to 2011, with most reds being from the 2009 and 2010 vintages. Looking at the list of Favorites, there’s a pretty even split between the 2009 and 2010 reds, with a smattering of older and younger vintages included as well. And although there were quite a few fine whites and Rosés this year – mostly 2010s and 2011s – I found that the Favorites list is slightly more skewed toward reds than it was last year. Just missing the Favorites list were wines from Idle Hour, Rosa d’Oro, Rua, Stepping Stone, Ten Acre, and The Winery SF, as well as additional wines from Ancien, Bailiwick, Benovia, Buttonwood, Chester’s Anvil, Sojourn, Tablas Creek, and Tercero. I noticed that there are few Chardonnays on the Favorites list, and I realized when reviewing my notes that I didn’t actually taste that many Chards this year. It was not a conscious decision, but I suppose my effort to taste more of the lesser-known grape varieties reduced the time I had for Chardonnays. In the end, I also realized there are few of the more obscure varieties that made the Favorites list. While there were a number of interesting wines poured at the event that were made from these grapes, I think they’re not yet in the same quality league as the “tried-and-true” varieties for which California is best-known. But as more wineries continue to work with the lesser-known grapes, I’m sure that we’ll see a greater number of standout wines from them in the future. I did not include library wines on the Favorites List, but notable ones that I tasted included a Calera 1999 Mills Vineyard Pinot Noir, Hitching Post 2004 Bien Nacido Vineyard Pinot Noir, and Laurel Glen 1996 Cabernet Sauvignon. Favorite wine line-ups this year included those from Bailiwick, Benovia, Cowan, Donum, Frostwatch, Lagier Meredith / Chester’s Anvil, Sojourn, and Tablas Creek, while Ancien and Vellum were among those who presented solid line-ups as well. Paloma, with its single wine on display, was also outstanding. Of these, Bailiwick, Cowan, and Vellum are relative newcomers to the California wine scene and should be labels worth watching in the coming years. Impressive wines from producers that were new to me included bottlings from Larry Hyde & Sons, Mt. Brave, and Parallel. Overall I felt that the wines I tasted this year were a step up from last year. That may be partly a factor of which wines I tasted, although I thought that quite a few 2010 reds were showing exceptionally well already for such young wines, and many 2009s were certainly helped by additional time in the bottle compared with last year. As I’ve said before, there is no single wine tasting event that beats this one for tasting the tremendous variety of wines that California has to offer, and it’s certainly worth making the effort to attend one of the Family Winemakers of California tastings if you have the opportunity. Ampelos 2011 Viognier, “Phi,” Santa Ynez Valley. Sourced from Evergreen, Cuatro Vientos, and Vigna Cesarina vineyards. Very light color, this displayed aromas of stone fruit, minerals, and slight floral and herbal notes. Medium-light mouthfeel with bright acidity and a crisp finish, nice. Ampelos 2008 Pinot Noir, “Lambda,” Ampelos Vineyard, Sta. Rita Hills. From 115, 667, 777, 828, 2A, and Pommard clones, about 33% new oak. Medium-light ruby color, showing cherry and herb along with a touch of vanilla/oak on the nose. Medium-light bodied with a smooth but lively texture and milder tannins. Ampelos 2007 Pinot Noir, “Rho,” Ampelos Vineyard, Sta. Rita Hills. A barrel selection with longer barrel-aging in 50% new oak. Slightly darker color, this had a similar character to the “Lambda” but with more intense aromatics and a bigger herb and oak components. Richer mouthfeel with a bigger structure and more grip on the finish. Ampelos 2008 “Syrache,” Santa Barbara County. 72% Syrah and 28% Grenache, sourced from Alisos and Los Tres Burros vineyards, aged in about 35% new oak. Medium color, with darker berry fruit, minerals, spice, and savory components. Medium weight in the mouth with a firm tannic finish. Ampelos 2007 Grenache, “Delta,” Ampelos Vineyard, Sta. Rita Hills. 100% Grenache, aged for 33 months in 50% new oak and 50% neutral oak. Medium-dark color, featuring strawberry and raspberry, earth, pepper, and sweet oak aromas. Bright and lively on the palate, finishing with big, grippy finish, in need of further time in the cellar. Ancien 2010 Chardonnay, Carneros. Light yellow color, with apple and stone fruit aromas along with touches of earth and oak. Medium-rich mouthfeel with a fairly smooth finish. Ancien 2010 Pinot Noir, Shea Vineyard, Oregon. Medium-light ruby color, with red cherry fruit, sweet oak, spice, and some herb notes on the nose. Medium-light body with good structure and moderate tannins, nice. Ancien 2010 Pinot Noir, Red Dog Vineyard, Sonoma Mountain. Slightly darker color, this showed a more savory character along with red fruit, floral, herbal, and earth components. Medium weight on the palate with bright acidity and moderate tannic grip on the finish. Tasty now, this has the potential to develop very nicely. Ancien 2010 Pinot Noir, Fiddlestix Vineyard, Sta. Rita Hills. Medium color, displaying a more forward darker fruit profile, spice, and vanilla/oak. Bigger and richer mouthfeel, finishing with medium tannins. Comments: Good showing for the Ancien wines. Praxis 2011 Viognier, Russian River Valley. Light color, with floral peach and nectarine flavors and touches of tropical fruit. Medium-rich texture with a smooth finish. Praxis 2008 Lagrein, Central Coast. Medium-dark purple, featuring earthy and herbal blueberry and boysenberry aromas. Medium-bodied, with a firmly tannic finish. Arbois 2006 Cabernet Sauvignon, Alexander Valley. Aged two years in barrel and two years in bottle. Medium-dark color, this showed currant and darker berry fruit with hints of mint, pepper, and vanilla/oak. Moderately rich mouthfeel with very grippy tannins on the finish. 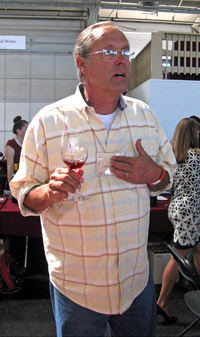 Comments: Winemaker Bill Arbois produces wines under both the Arbois and Praxis labels. The Arbois wines are made from estate fruit while Praxis wines use purchased fruit. Bailiwick 2010 Vermentino, California. The fruit was sourced from Paso Robles and Lake County. Very light color, with bright citrus and stone fruit aromas. Medium-bodied with a fairly smooth texture and finish, nice. Bailiwick 2010 Pinot Noir, “Borderline,” Marin County. Sourced entirely from Kendric Vineyard in 2010, with 115 and 777 Pinot clones. Medium-light color, this showed bright black cherry fruit, earth, and minerals. Medium-light weight in the mouth, with good balance and lively acidity, finishing with milder tannins, nice. Bailiwick 2010 Pinot Noir, Russian River Valley. Sourced from three vineyards, with six Pinot clones. Medium ruby color, displaying cherry, herb, and a touch of sweet oak on the nose. Medium-bodied with good structure and moderate tannins. Bailiwick 2010 Pinot Noir, Sonoma Coast. From 115 and Pommard clones grown at Ross Ranch southwest of Sebastopol. Medium-light color, showing a more savory and herbal character along with bright red fruits and a forest floor note. Nice texture and structure on the palate, with a moderately tannic finish, nice. Bailiwick 2010 Pinot Noir, “Foray,” Russian River Valley. Sourced from RLR Vineyard just outside Forestville, this includes 113, 114, and 115 clones, picked and fermented together. Medium-light color, this featured minerally cherry and plum fruit, herbs, and earth aromas. A bit more weight and richness in the mouth, this finished with medium tannins. Bailiwick 2010 Cabernet Franc, Russian River Valley. From Alegría Vineyard near Healdsburg. Medium-dark color, with plummy fruit along with earth, herbs, and some vanilla/oak notes. Medium-full bodied with a lively mouthfeel, with moderate tannins on a long, tasty finish, nice. Comments: Brothers Bryan and Paul Vais poured their wines again this year. The Foray Pinot Noir bottling highlights a selected vineyard that will change from year to year. Benovia 2010 Chardonnay, Sonoma Mountain. A small production bottling only available through the winery. Light yellow color, with bright apply fruit along with lees and spice notes. Medium-light bodied with a crisp finish, nice. Benovia 2010 Chardonnay, "La Pommeraie," Russian River Valley. Light yellow, this showed riper stone fruit character, along with spice and vanilla/oak. Fairly rich with a creamy texture but nice balancing acidity, the finish was long and smooth. Benovia 2010 Chardonnay, Estate, Russian River Valley. Mostly Wente and Rued Musque Chardonnay clones. Slightly lighter color, displaying floral aromas along with citrus and apple, plus a touch of sweet oak. Medium weight with a lively mouthfeel leading to a smooth finish, distinctive and quite nice. Benovia 2009 Pinot Noir, Savoy Vineyard, Anderson Valley. Medium ruby color, with spice, earth, and tea leaf aromas upfront and black cherry fruit in support. Medium-bodied and well-structured, finishing with moderate tannins. Lots of potential in this wine, which should develop with more cellar time. Benovia 2010 Pinot Noir, Sonoma Coast. Medium-dark color, more fruit-forward with darker berries, lots of spice, and an herbal note. More weight than the Savoy bottling, with medium tannins on the finish. Benovia 2009 Zinfandel, Sonoma County. Medium-dark color, featuring ripe blueberry, plenty of baking spice, and a dash of vanilla. Medium-full bodied with a fairly smooth texture on the palate but moderately grippy tannins on the finish. Comments: Benovia presented another strong group of wines this year. Buttonwood 2011 Sauvignon Blanc, “Zingy,” Estate, Santa Ynez Valley. Harvested early and cold-fermented in stainless steel with no malolactic fermentation – includes only free-run for the 2011 vintage. Very light straw color, with bright lemon, grapefruit, and herb aromas. A bit more weight on the palate than earlier vintages but with plenty of “zingy” acidity and a clean, crisp finish, very nice. Buttonwood 2010 Sauvignon Blanc, Estate, Santa Ynez Valley. 89% Sauvignon Blanc made in stainless steel, 11% Semillon, barrel-fermented. Light color, this featured lemon and nectarine notes plus touches of herbs and lees. Moderately rich, creamy mouthfeel along with a minerally texture and a lively finish. Buttonwood 2010 Marsanne, Estate, Santa Ynez Valley. Fermented in neutral oak. Very light color, displaying stone fruit and spice on the nose. Medium-bodied with good acidity, a chalky note, and a long finish. Quite a nice young Marsanne that has the potential age well. Buttonwood 2011 Syrah Rosé, Estate, Santa Ynez Valley.100% Syrah, grown and picked just for the Rosé, mostly whole-cluster pressed, all made in stainless steel. Very light pink color, with bright strawberry, citrus, floral, and herb aromas. Light and lively on the palate, with a fresh, crisp finish. This is consistently an excellent Syrah-based Rosé. Buttonwood 2010 Grenache-Syrah, Santa Ynez Valley.60% Grenache, 40% Syrah. Medium color, featuring ripe black cherry, spice, earth, and a touch of vanilla/oak. Medium-bodied with moderate tannins and a tangy finish. Buttonwood 2009 Cabernet Franc, Estate, Santa Ynez Valley.100% Cabernet Franc. Medium color, with plum and darker fruit notes, a strong herbal component earth, plus, earth, leather, and pepper. Medium-bodied with lively acidity and grippy tannins on the finish. Buttonwood 2009 “Hawk Red,” Estate, Santa Ynez Valley.50% each Cabernet Sauvignon and Cabernet Franc. Medium-color, with herbal plum and blueberry aromas, smoke, and a touch of vanilla/oak. Fairly big mouthfeel with moderate grip on the finish. A good value red – a “Wednesday meatball wine” according to Karen Steinwachs. Comments: Buttonwood winemaker Karen Steinwachs was behind the table along with her husband Dave Robinson and Buttonwood’s president and managing partner Bret Davenport. Calera 2010 Aligoté, Mount Harlan. Very light color, with shy aromas of stone fruit and pear, along with a minerally note. Medium-light bodied, with an oily texture and fairly smooth finish. Calera 2010 Viognier, Mount Harlan. Very light color, this displayed ripe peach and nectarine notes plus a touch of spice. Fuller-bodied, this had a big, rich finish that was smooth and lingering. 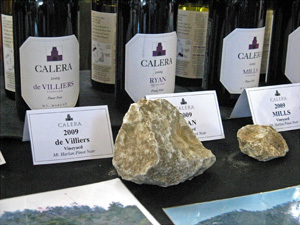 Calera 2009 Pinot Noir, de Villiers Vineyard, Mount Harlan. Some whole-cluster fermentation. Medium-light ruby color, featuring bright strawberry, herbs, minerals, and earth. Medium-bodied with a lively mouthfeel and finish and relatively mild tannins, nice. Calera 2009 Pinot Noir, Mills Vineyard, Mount Harlan. Light color, showing a more stemmy and herbal character along with ripe red fruits. Intense and structured in the mouth, with a grippy tannic finish, this is still years from showing its best. Calera 2009 Pinot Noir, Jensen Vineyard, Mount Harlan. Light garnet color, with some funky, earthy notes along with strawberry and cherry fruit and green, stemmy whole-cluster character. Somewhat bigger texture than the Mills, finishing with very hard, chalky tannins. Calera 1999 Pinot Noir, Mills Vineyard, Mount Harlan. Light color turning brickish, the herbal whole-cluster notes were apparent but more in harmony with the red fruit, spice, and earth components. Probably still not yet at its peak, it would be interesting to try this again in another five years or so. Comments: Calera always brings out some older Pinots to display how their whole-cluster fermentation character evolves with bottle age. In general, I think the “stemmy” component in recent vintages is still considerable but not as pronounced as it used to be, and the 2009 de Villiers Vineyard bottling – which uses less whole cluster – showed exceptionally well for a young Calera Pinot. Clos Saron 2011 “Out of the Blue,” Sierra Foothills. 90% Cinsault, 5% Syrah, 5% Tempranillo. Medium color, with bright wild berry, earth, and mineral aromas, plus touches of smoke and herbs. Medium-bodied with a lively texture, finishing with milder tannins, a nice and distinctive wine. Clos Saron 2010 “Deeper Shade of Blue,” California. 64% Cinsault, 33% Syrah, 3% Roussanne. Medium color, showing dark berry fruit, pepper, and spice. More weight than the first wine, with a smoother mouthfeel and peppery finish. Clos Saron 2007 “Black Pearl,” Sierra Foothills. About 50% Syrah, 30% Cabernet Sauvignon, 10% Petit Verdot, 10% Viognier. Medium purple color, this displayed a more high-toned character, with earthy and herbal components upfront along with darker fruit. Medium-bodied with moderate tannins and a tangy finish. Comments: Clos Saron owner/winemaker Gideon Beinstock poured his wines at the event. The “Out of the Blue” bottling, made with fruit from 120+ year-old Cinsault vines, was my favorite. Kuyam 2007 Grenache/Cabernet Franc/Malbec, California.This is a “one-off” bottling consisting of 34% Grenache, 33% Cabernet Franc, and 33% Malbec, aged about 44 months in barrel. Medium purple color, with bright black cherry, tobacco/dried herbs, a touch of black pepper, and spice. Medium-rich texture with good acidity and a somewhat tangy and moderately tannic finish. Core 2008 Grenache, “Reserve,” Santa Barbara Highlands Vineyard, Santa Barbara County. 100% Grenache, 15% whole-cluster fermentation, aged 35 months in larger cooperage. Medium-light color, this featured bright red fruits, earth, minerals, and hints of spice on the nose. Big and structured, finishing with fairly grippy tannins. Tasty now and should age well for at least a few years. Core 2008 Mourvèdre, Alta Mesa Vineyard, Santa Barbara County. 100% Mourvèdre, this is a different wine than the Core “Mister Moreved” bottling. Medium-dark color, showing higher-toned plum aromas plus earth, herbs, and vanilla/oak. Medium-full bodied, finishing with the big, chalky tannins typical of this vineyard. Kuyam 2007 “Cuvée Nolan,” Santa Barbara Highlands Vineyard, Santa Barbara County. 74% Cabernet Sauvignon, 19% Cabernet Franc, 4% Petite Verdot, 3% Merlot, aged about 50 months in barrel and six more in bottle. Medium-dark color, with ripe plum, lots of tobacco and dried herb notes, and touches of smoke and earth. Medium-bodied with a lively mouthfeel, this had a grippy tannic finish. A promising wine that needs time in the cellar. Comments: I’d tasted some of Dave Corey’s wines earlier this year so I limited myself to just a few of his wines this time. Many of the latest releases have received extended barrel aging. Stepping Stone 2009 Cabernet Franc, Napa Valley. Medium-dark purple, showing currant and plum fruit, a significant herbal component, with a touch of vanilla/oak. Medium weight with good balance and a lively texture, finishing with moderate tannins, nice. Comments: Stepping Stone is the second label of Cornerstone Cellars. Cowan 2010 Sauvignon Blanc, “Isa,” Lake County. 100% Sauvignon Blanc, skin-fermented. Medium gold-yellow color, featuring lemon and stone fruit aromas, spice, and a savory component. Moderately rich on the palate but with fine acidity, and a bright, tasty finish. A very nice and highly distinctive wine. Cowan 2010 Pinot Noir, Sonoma Coast. Medium-light ruby color, with pretty aromatics of bright cherry, flowers, herbs, and earth. Lighter weight on the palate, the juicy acidity balanced the fruit and led to a long, clean finish, nice. Cowan 2010 Pinot Noir, Bennett Valley. Medium color, this is the Sonoma Coast bottling’s big brother, showing black cherry and darker fruits, herbs, spice, and savory notes. Medium-big texture and structure, with more noticeable tannins on the finish. A few years of cellar time should show more of what this wine has to offer. Cowan 2010 Syrah, Bennett Valley. Sourced from Moaveni Vineyard. Medium-dark color, displaying beautiful floral aromas along with blackberry, pepper, and herbs. Medium-full bodied with a fresh and lively texture and moderately grippy tannins. Really shows its cool-climate origins well, quite nice. Comments: I had tasted the first three wines with Jim Cowan a couple of months previously, but I wanted to try them again in this setting, and I thought they showed just as well. The new Syrah was among the best I tasted at the event. Casaeda 2011 Gewürztraminer, Mendocino County. Very light color, with shy citrus and lychee fruit. Lighter-bodied with a fairly bright mouthfeel and finish. Casaeda 2010 Syrah, Sonoma Valley. Medium purple color, this featured bright plum and blueberry aromas plus spice and earth notes. Medium-light weight and lively on the palate, with milder tannins. Casaeda 2009 Cabernet Sauvignon, Napa Valley. Sourced from two vineyards near Oakville, and blended with a little Syrah and Petit Verdot. Medium-dark color, showing darker fruit, spice, and vanilla/oak on the nose. Medium-full bodied, this finished with moderately grippy tannins. Comments: Casaeda is second label of Culler Wines. 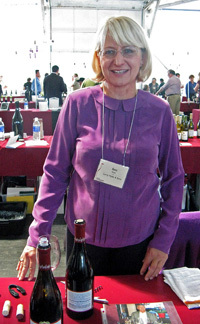 Owner/winemaker Karen Culler is also the winemaker for Ladera and several other producers. Dancing Coyote 2011 Grüner Veltliner, Estate, Clarksburg. Very light color, displaying citrus and stone fruit along with touches of earth and fresh herbs. Bright and lively in the mouth, with a clean finish. Dancing Coyote 2011 Pinot Grigio, Estate, Clarksburg. Light color, floral aromas plus peachy fruit. More weight on the palate, with a touch of sweetness on the smooth finish. Dancing Coyote 2011 Moscato, Estate, Clarksburg. Very light color, this was very floral and perfumey. Medium-bodied with a fairly smooth texture and a slightly sweet finish. Comments: The Dancing Coyote whites are made entirely in stainless steel with no malolactic fermentation. I had tasted their very good Albariño, along with their Verdelho and Tempranillo a few months earlier, so I limited myself to some of their other wines this time. Dashe 2011 Zinfandel, “Les Enfants Terribles,” McFadden Farm, Potter Valley. From 30-year old vines. Medium-light color, shy aromas of earth, plum and blueberry, and touches of pepper and minerals. Lighter-bodied for a Zin, with a lively texture and milder tannins, very distinctive. Dashe 2009 Zinfandel, Florence Vineyard, Dry Creek Valley. Medium color, more fruit-forward than the first Zin plus spice, dried herbs, and loads of black pepper. Medium weight on the palate, finishing with moderate tannins, nice. Dashe 2009 Zinfandel, Todd Brothers Ranch, Old Vines, Alexander Valley. Medium-dark color, showing ripe red fruits, more spice, and a dash of vanilla/oak on the nose. Bigger and more structured in the mouth, with a grippy tannic finish. Dashe 2007 Cabernet Sauvignon, Alexander Valley. Medium-dark color, this displayed dark berry fruit, earth, herbs, and chocolate. Full-bodied with very firm, chewy tannins that need time to soften. Derby 2009 Pinot Gris, Derbyshire Vineyard, San Simeon, San Luis Obispo County. Whole-cluster pressed and fermented in stainless steel, then aged in stainless steel and neutral oak. Light straw color, featuring bright pear and stone fruit aromas and a touch of spice. Fairly smooth mouthfeel but with a lively texture on the finish. Derby 2009 “Fifteen10” White, Derby Vineyard, Paso Robles. 43% Marsanne, 33% Roussanne, 24% Viognier, made in stainless steel and neutral oak. Medium-light straw color, this showed ripe stone fruit, along with leesy and floral notes. Medium-bodied, this had fine acidity that carried through on the long finish, nice. Derby 2007 “Implico,” Paso Robles. 39% Cabernet Sauvignon, 22% Merlot, 22% Cabernet Franc, 17% Petit Verdot, aged in 82% new French oak. Medium-dark purple, with herbal plum and currant fruit along with spice and vanilla/oak on the nose. Medium-rich mouthfeel with a grippy tannic finish. Stemmler 2009 Pinot Noir, Estate, Carneros. Includes Dijon, Martini, Roederer, Calera, Hanzell and Swan selections, aged in 30% new French oak. Medium color, ripe black cherry, earth, and vanilla/oak aromas. Fairly rich mouthfeel with a smooth finish. Stemmler 2010 Pinot Noir, Nugent Vineyard, Russian River Valley. From 115 and 667 clones, aged in 35% new French oak. Slightly lighter color, with brighter cherry, spice, and sweet oak on the nose. Medium-bodied and more lively on the palate with relatively mild tannins on the finish. Donum 2008 Pinot Noir, Estate, Carneros. 667, Martini, Calera, and Roederer Pinot selections, aged in 70% new French oak. Medium-light color, this was less fruit-forward than the first two wines, showing earthy cranberry and strawberry fruit, herbs, black pepper, and undertones of vanilla/oak. Medium weight in the mouth, with more structure and grippier tannins. Donum 2009 Pinot Noir, Estate, Russian River Valley. From 115 and 667 clones, aged in 60% new French oak. Medium color, displaying bright red fruits, herbs, earth, and a touch of cola. Moderately rich but with a lively texture and finish, nice. Donum 2010 Chardonnay, Estate, Carneros. Includes 88% Wente clone and 12% Dijon clone 76, made in 25% new French oak. Light color, with aromas of citrus and green apple, herbs, and a mineral note. Bright acidity in the mouth, with a clean, fresh finish, nice. Comments: Kenneth Juhasz is the consulting winemaker for both Donum and its sister label Robert Stemmler. The Donum wines in particular were impressive. Pip 2011 Chardonnay, California. Made entirely in stainless steel. Very light straw color, with ripe pear and stone fruit aromas along some leesy notes. Lighter-bodied, smooth, and fairly straightforward. Dunstan 2010 Chardonnay, Durell Vineyard, Sonoma Coast. Light yellow color, this showed apple and pear, spice, and vanilla/oak on the nose. Medium-light weight, with a richer texture than the Pip bottling and a longer finish. Dunstan 2009 Pinot Noir, Durell Vineyard, Sonoma Coast. Medium color, the vanilla/oak component stood out, with cherry, spice, and earth in the background. Medium-bodied with a lively texture but somewhat rough and woody finish that will need time to smooth out. Comments: All of the Dunstan wines are sourced from a single 8½-acre block of Durell Vineyard, which is owned by winery co-owner Ellie Phipps Price. Pip is Dunstan’s second label. Field Recordings 2011 “Old Potrero,” Arroyo Grande Valley. A field blend from head-pruned vines, with 29% Mourvèdre, 22% Syrah, 18% Grenache, 18% Cabernet Sauvignon, and 13% Zinfandel, made by carbonic maceration, aged in about 25% new oak. Medium color, with bright and spicy plum fruit with a somewhat “grapey” note. Medium-bodied with a lively mouthfeel and juicy finish, an easy-drinking wine with more interest than the usual pizza or burger red. Field Recordings 2010 “Chorus Effect,” Koligian Vineyard, Paso Robles. 54% Cabernet Sauvignon, 17% Cabernet Franc, 15% Petit Verdot, 14% Tannat, made in 100% new oak. Dark color, featuring ripe blueberry and plum, vanilla/oak, and baking spices on the nose. Big and rich, with only moderate tannins on the finish. Fiction 2011 “Fiction Red,” Paso Robles. 50% Zinfandel, 19% Mourvèdre, 10% Touriga, 8% Petite Sirah, 5% Grenache, 4% Syrah, 4% Tempranillo. Dark color, this showed dark fruits, herbs, and spicy oak aromas. Medium-full weight on the palate, with grippier tannins on the finish, a nice wine that could use a bit more time in the bottle. Comments: I’d tasted a number of Field Recordings and Fiction wines at their winery in Paso Robles this spring, so I limited myself to a few new releases this time. The Field Recordings Chenin Blanc, which I didn’t taste on this occasion, has been a consistent standout. Frostwatch 2011 “Kismet,” Sonoma County. 88% Sauvignon Blanc, 12% Semillon, whole-cluster pressed and made mostly in stainless steel. Very light color, showing citrus and lightly grassy aromas. Bright mouthfeel with crisp acidity and a clean, tasty finish, nice. Frostwatch 2009 Chardonnay, Bennett Valley. Barrel-fermented and aged sur lie. Light color, with apple, lees, and spice on the nose. Creamy texture with a lively finish. Frostwatch 2010 Pinot Noir, Bennett Valley. From Dehlinger Swan clone. Medium color, with plummy fruit, minerals, and touches of herbs and spicy oak. Bright mouthfeel with good structure and mild to moderate tannins, nice. Frostwatch 2009 Merlot, Bennett Valley. 100% Merlot. Medium-dark color, this had black cherry, spice, and notes of dried herbs and vanilla/oak. Medium-rich texture with a moderately tannic finish. Comments: This is the second straight year that I’ve been impressed by the Frostwatch wines, one of several Bennett Valley producers who have been raising the bar for that area in recent years. Hitching Post 2010 Pinot Noir, “Cork Dancer,” Santa Barbara County. Sourced from Bien Nacido, Cambria, Rio Vista, and Sierra Madre vineyards. Medium-light color, featuring bright red fruits, spice, and a touch of sweet oak. Medium-bodied with a fairly smooth texture and finish. A straightforward but tasty Santa Barbara Pinot. Hitching Post 2007 Merlot, Santa Barbara County. Medium color, with ripe cherry, herb, smoke, and spice aromas. A middle-weight Merlot with good structure and a lingering finish. Hitching Post 2008 Pinot Noir, “Perfect Set,” Sta. Rita Hills. Barrel selection, sourced from Fiddlestix vineyard. Medium-light color, with minerally red fruits, spice, earth, and vanilla/oak on the nose. Medium-bodied and lively on the palate, with finishing tannins that suggest that a few years of bottle age will improve an already-tasty wine. Hitching Post 2002 Pinot Noir, Sanford & Benedict Vineyard, Santa Rita Hills. Slightly brickish color, showing aromas that were more savory than fruity, along with earthy and herbal notes. Medium-light bodied, with a tangy finish. Hitching Post 2004 Pinot Noir, Bien Nacido Vineyard, Santa Maria Valley. Medium-light color, this displayed more fruit on the nose than the S&B bottling, with cherry and plum plus spice and dried herbs. Medium weight, this was livelier in the mouth and still showed mild to moderate tannins – aging quite well. Idle Hour 2010 Pinot Noir, “Clone 777,” Santa Lucia Highlands. Medium color, aromatic cherry and spice along with an herbal note. Medium-bodied with nice acidity and moderate finish. Idle Hour 2009 Tempranillo, Clarksburg. Medium-dark color, with earthy plum, smoke, and herb aromas. Medium-bodied with fairly grippy tannins on the finish. Idle Hour 2010 Cabernet Franc, Central Coast. Medium-dark color, this featured quite herbal dark fruit along with vanilla/oak on the nose. Medium weight with a fairly smooth mouthfeel and finish. Idle Hour 2010 Petite Sirah, Clarksburg. Aged 18 months in neutral oak. Dark color, this had blueberry and blackberry fruit, spice, a savory note, and lots of black pepper. Medium-full bodied, this had good structure with a firm tannic finish, a nice young Petite Sirah that should improve with some bottle age. Ispiri 2009 “Maylena,” Pine Mountain-Cloverdale Peak. 90% Merlot, 6.5% Cabernet Sauvignon, 3.5% Petit Verdot, 35% new oak. Medium-dark color, with black cherry, tobacco, spice, and undertones of vanilla/oak. Lively and well-structured, this finished with moderate tannins, nice. Ispiri 2009 “Rocky Red,” Rockpile. 42% Merlot, 40% Cabernet Franc, 18% Petit Verdot, 20% new oak. Dark purple color, this displayed a darker fruit profile, along with bigger spice and tobacco/dried herb components. Bigger mouthfeel with a firmer tannic finish. Ispiri 2009 Petit Verdot, Rockpile. 80% Petit Verdot, 20% Merlot, 40% new oak. Dark color, showing a more minerally character along with dark fruit, mocha, and spice. Big and structured, with grippy tannins. Ispiri 2009 Cabernet Sauvignon, Pine Mountain-Cloverdale Peak. 82% Cabernet Sauvignon, 14.5% Merlot, 3.5% Petit Verdot, 50% new oak. Dark color, more fruit-forward aroma, featuring currant and plum, herb, and vanilla/oak. Another big wine, with chewy tannins that will need time in the cellar to resolve. Comments: Arista winemaker Leslie Sisneros is behind the Ispiri label. Two of their new releases are labeled with the new Pine Mountain-Cloverdale Peak AVA, approved in late 2011. All the bottlings are structured wines from mountain vineyards. La Jota 2009 Cabernet Sauvignon, Howell Mountain, Napa Valley. Medium-dark color, with black pepper and dried herb/tobacco notes upfront, along with plum and currant fruit and earth on the nose. Medium-full bodied and structured with a very grippy tannic finish. Mt. Brave 2009 Cabernet Sauvignon, Mount Veeder, Napa Valley. Medium to medium-dark color, featuring currant and plum fruit, black pepper, and mineral aromas. Medium-full bodied with very good structure and fairly big but refined tannins, nice. Comments: Chris Carpenter makes the wine for both the La Jota and Mt. Brave labels, and they were both poured at the La Jota table. Ladd 2008 Pinot Noir, “Cuvée Abigail,” Sonoma Coast. Medium-light color, with aromas of cherry, raspberry, earth, and lots of spice. Medium weight on the palate with good acidity, leading to a lively and slightly tangy finish. Ladd 2008 Pinot Noir, Moore Ranch, Russian River Valley. Medium-light color, displaying more earthy notes along with cherry and herbs. A bit richer mouthfeel, but finishing with bright acidity and moderate tannins that suggest this should benefit from some time in the cellar. Chester’s Anvil 2010 Gewürztraminer, Mendocino. Very light color, displaying intense stone fruit and lychee aromas. Medium-bodied with a bright mouthfeel, this had just the slightest tinge of sweetness on the long and juicy finish, nice. Chester’s Anvil 2010 Chardonnay, Stagecoach Vineyard, Napa Valley. Light straw color, with ripe apple and stone fruit, vanilla, and butter on the nose. Big and rich with a slightly oily texture, this had a smooth finish – definitely a bigger-style Chard. Chester’s Anvil 2010 “Hattori Hanzo,” Napa Valley. 38% Malbec, 25% Cabernet Sauvignon, 25% Syrah, 12% Cabernet Franc. Dark color, this showed plum and blueberry fruit, dried herb and tobacco, and spice. Big and bold with firm, grippy tannins on the finish, this has lots of potential but needs time to develop. Chester’s Anvil 2010 Zinfandel, Mead Ranch, Atlas Peak, Napa Valley. Medium purple color, with bright wild berry, spice, and a touch of black pepper. Medium-bodied and lively, the youthful tannins sneaked up on the finish. Chester’s Anvil 2010 Malbec, Mount Veeder, Napa Valley. 100% Malbec, from Brandlin Ranch. Dark color, with aromas of dark berry fruit, cedar, spice, dried herbs, and minerals. Full-bodied, finishing with big tannins that were broad and mouth-coating. Very tempting even now but should get better with more bottle age, nice. Lagier Meredith 2010 Syrah, Mount Veeder, Napa Valley. Dark purple color, this featured a pretty floral component along with blueberry, roasted meat, pepper, and spice. Medium-full bodied, this finished with more grippy tannins than mostLagier Meredith Syrahs – quite tasty but in need of some time in the cellar. Lagier Meredith 2010 Mondeuse, Mount Veeder, Napa Valley. Dark color, with more earthy aromatics than the Syrah, along with dark berry fruit, spice, and a “sauvage” note. Brighter mouthfeel than the Syrah, this finished with bigger tannins than the 2009 Mondeuse – another wine to lay down for a few years. Comments: Steve Lagier & Carole Meredith poured their latest Chester’s Anvil wines (a collaboration with their neighbors Aaron & Claire Pott of Pott Wine) along with their Lagier Meredith wines. All the wines were bottled just a few weeks before the tasting. Always among my favorites each year, this group of wines did not disappoint. Larry Hyde & Sons 2009 Pinot Noir, Carneros. Medium ruby color, with higher-toned red fruits, earth, and lots of spice on the nose. Medium-bodied with a moderately tannic finish. Larry Hyde & Sons 2010 Pinot Noir, Carneros. Slightly lighter color, this featured pretty floral aromas along with bright cherry, rhubarb, spice, and a dash of vanilla/oak. A more seamless texture than the 2009 with noticeable but refined tannins on the finish, very nice. Comments: Larry Hyde, owner of the famed Hyde Vineyard in Carneros, launched this new label in 2009 with his sons Peter and Christopher. The 2010 Pinot Noir was one of my favorite Pinots from the tasting. Lateral 2009 “Lateral,” Napa Valley. 45% Merlot, 20% Cabernet Sauvignon, 14% Cabernet Franc, 14% Malbec, 7% Petit Verdot. Medium-dark color, showing smoky black cherry and plum fruit, herbs, and vanilla/oak. Medium-full bodied with a fairly smooth texture and moderate tannins. Laurel Glen 1996 Cabernet Sauvignon, Sonoma Mountain. Poured from a 3-liter bottle. Medium ruby color, with tobacco/herb aromas leading the way, followed by black cherry, smoke, earth, and a touch of spice. Medium-light weight and lively on the palate, the finish still showed ample tannins. Very enjoyable older Cab. Laurel Glen 2009 Cabernet Sauvignon, Sonoma Mountain. Medium-dark purple, this displayed tobacco, black pepper, plum, and sweet oak on the nose. Medium-light bodied, moderately rich but with good structure and grippy, youthful tannins. Comments: The Laurel Glen Cabernet Sauvignons are 100% varietal, and made entirely from estate fruit. 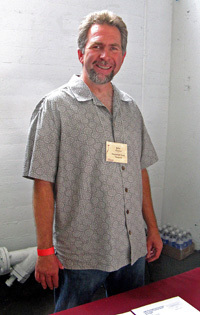 David Ramey took over as consulting winemaker starting with the 2009 vintage. It was a treat to taste the 1996 Cab – I got to the table just in time as the wine was nearing the bottom of the bottle. Lava Cap 2009 Barbera, El Dorado County. Medium-dark color, showing cherry, a touch of minerals, and spice. Fairly rich with moderate acidity, this had medium tannins on the finish. Mahoney 2011 Vermentino, Las Brisas Vineyard, Carneros. Very light straw color, this displayed bright, minerally pear and melon aromas. Medium weight in the mouth, with a pleasant and moderately long finish. Mahoney 2009 Pinot Noir, Mahoney Ranch, Carneros. From Swan, 23, UCD 107, and 667 clones. Medium-light color, earthy plum fruit along with dried herbs and pepper. Structured and fairly tannic, in need of some cellar time. Mahoney 2009 Montepulciano, Las Brisas Vineyard, Carneros. Medium color, showing very earthy aromas with plum, spice, and a touch of white pepper in the background. Medium-bodied with grippy tannins. Mahoney 2009 Nebbiolo, Las Brisas Vineyard, Carneros. Medium-light garnet color, with earth, cherry, and herb aromas. Bright mouthfeel with firm but refined tannins on the finish. Mounts 2009 Grenache, Dry Creek Valley. Medium-dark color, this showed higher-toned ripe red fruits and a touch of spice. Bigger-bodied for a Grenache, with a very grippy finish. Paloma 2008 Merlot, Spring Mountain District, Napa Valley. About 15% Cabernet Sauvignon. Medium-dark purple, this displayed black cherry, spice, dried herbs, and undertones of vanilla/oak. Medium weight in the mouth, structured yet with a smooth and moderately rich texture, refined tannins and a long finish, nice. Comments: As usual, Paloma owner Barbara Richards and her winemaker son Sheldon were behind the table. It’s consistently been a standout over the years and it remains so. Parallel 2009 Cabernet Sauvignon, Napa Valley. Medium-dark color, featuring ripe plum fruit, herbs, and sweet oak. Medium-bodied with a moderate finish. Parallel 2009 Cabernet Sauvignon, “Black Diamonds,” Estate, Napa Valley. Medium-dark color, this had more focused aromas of currant and darker fruit, spice, and a minerally note, with oak and herb components being better integrated. A bit more full-bodied than the first Cab, with a lively texture and grippier finish. Nice wine that has the potential to age well. Comments: The Parallel wines are made by noted winemaker Philippe Melka. The estate vineyard is located in the upper part of Conn Valley. Rosa d’Oro 2011 Muscat, Yolo County. 60% Moscato Giallo, 40% Muscat Canelli, 0.7 residual sugar. Very light straw color, with floral and stone fruit aromas. Medium-light bodied with a smooth texture and a lightly sweet finish. Rosa d’Oro 2010 Sagrantino, Tracy Hills. The vines were propagated from cuttings imported by Randall Grahm. Medium color, this showed earthy red fruits and spice on the nose. Medium weight on the palate with good structure and a moderately tannic finish, a promising young wine. Rosa d’Oro 2010 Nero d’Avola, “Riserva,” Tracy Hills. Medium color, with similar aromatics to the Sagrantino though with a somewhat darker fruit profile. Bigger in body with a grippier finish. Rosa d’Oro 2010 Montepulciano, Tracy Hills. Medium color, showing brighter raspberry and black cherry notes, along with herbs and earth. Medium-full bodied, this had noticeably chalky tannins on the finish. Comments: Pietro Buttitta was behind the table pouring his wines at the event. All of the Tracy Hills fruit came from Mt. Oso Vineyard. The Sagrantino grape, originally from Umbria, is rare in California – only about ten acres are currently grown here. Rua 2009 “Rua,” Napa Valley. 67% Merlot, 33% Cabernet Franc, co-fermented, about 40% new oak. Medium-dark color, featuring plum and darker berry fruit, baking spice, dried herb, and vanilla/oak aromas. Medium-full bodied with a pleasant, moderately tannic finish. Comments: The Rua wine featured their “Capabunga” – a re-sealable silicone closure. Interesting closure aside, the wine was very nice. Saddleback 2007 Cabernet Sauvignon, Napa Valley. Aged in 65% new oak. Medium-dark color, this had a funky, leathery component to the aroma, along with darker berry fruit and spice. Medium-bodied with good acidity and big, chewy tannins on the finish. 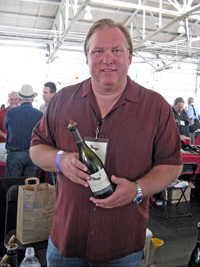 Comments: The Saddleback wines are made by noted Napa winemaker Nils Venge. Sanglier 2010 Chardonnay, Sonoma Coast. 25% new oak. Light color, with apple and pear fruit along with some spice and vanilla/oak notes. Medium-light weight on the palate with a lively finish. Sanglier 2010 Pinot Noir, Russian River Valley. Sourced from one vineyard along the Middle Reach and one in the Sebastopol Hills. Medium ruby color, this showed plum and blueberry fruit, spice, and a touch of sweet oak. Medium-bodied and well-balanced, this had moderate tannins on the lively and pleasant finish, nice. Sanglier 2009 “Rouge du Tusque,” Sonoma County. 49% Syrah, 33% Petite Sirah, 18% Grenache, sourced from Kick Ranch. Medium color, featuring plum, spice, black pepper, and oak on the nose. Fairly rich texture, with a grippy tannic finish. Comments: Russell Bevan was the Sanglier winemaker up to the 2010 vintage – winery owner Glenn Alexander and John Raytek of Ceritas now make the wines. Savannah-Chanelle 2009 Pinot Noir, Tondré Grapefield, Santa Lucia Highlands. Medium-light ruby color, this showed herbal red fruit aromas plus touches of earth and citrus. Medium-light bodied with bright acidity and finish. Savannah-Chanelle 2009 Pinot Noir, Armagh Vineyard, Sonoma Coast. Medium color, this had a funky band-aid aroma that masked whatever fruit was in this wine. Medium weight with good acidity, but the band-aid component was unpleasant. Savannah-Chanelle 2008 Syrah, Coastview Vineyard, Monterey County. Dark color, with bright and minerally plum and darker fruit on the nose. Medium weight on the palate with the structure to age, finishing with medium-big tannins. Sojourn 2011 Chardonnay, Sonoma Coast. Sourced from 50% Keller and 50% Sangiacomo vineyards, with about 50% malolactic fermentation and around 30% new oak. Medium-light color, displaying spiced apple, lees, and a touch of vanilla/oak. Medium-bodied with a moderately creamy texture, this had good acidity and a clean finish. Sojourn 2010 Pinot Noir, Rodgers Creek Vineyard, Sonoma Coast. Mostly Pommard clone along with 777, 10% whole-cluster fermentation, aged in about 50% new oak. Medium-light ruby color, with aromas of tangy red fruits, rhubarb, earth, minerals, and spice. Medium-light bodied with a lively finish, nice. Sojourn 2010 Pinot Noir, Sangiacomo Vineyard, Sonoma Coast. Mostly 115 and 777 clones, plus a little Swan and Pommard, entirely destemmed, about 50% new oak. Medium color, this showed ripe black cherry, smoke, spice, and undertones of sweet oak. Bigger and more structured than the Rodgers Creek bottling, with more tannic bite on the finish. Sojourn 2010 Pinot Noir, Ridgetop Vineyard, Sonoma Coast. From a vineyard near Annapolis, with 115, 667, and 777 clones, entirely destemmed, about 50% new oak. Medium ruby color, with brighter red fruit aromas along with earth, a minerally note, and a distinctive orange spice element. Richer mouthfeel than the first two Pinots, this also had fine acidity and a long finish with moderate tannins, nice. Sojourn 2009 Cabernet Sauvignon, Spring Mountain District, Napa Valley. Entirely Cabernet clone 7, aged in 75% new oak. Dark color, featuring currant and plum fruit, tobacco/herb, spice, and hints of chocolate/mocha. Medium-full bodied with a lively mouthfeel and good structure, finishing with moderately grippy tannins, nice. Sojourn 2009 Cabernet Sauvignon, “Proprietary Cuvée,” Napa Valley. 100% Cabernet Sauvignon, sourced from about 50% Beckstoffer Georges III Vineyard and 50% Showket Vineyard, aged in 75% new oak. Very dark color, this had riper and somewhat darker fruit aromas, herbs, and bigger spice and chocolate components. Quite rich on the palate, with a smoother texture and more refined finishing tannins than the Spring Mountain bottling, nice. 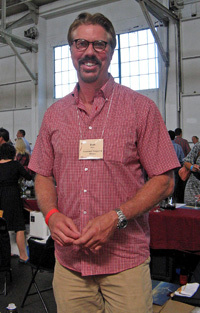 Craig Haserot poured a number of the latest Sojourn releases, and they were a strong line-up of wines. Tough to pick a favorite between the two Cabs – different from one another but both impressive. Summit Lake 2007 Zinfandel, Estate, Howell Mountain, Napa Valley. Medium color, this featured moderate aromas of ripe blueberry, pepper, and earth. Medium-bodied with a firm structure and fairly grippy tannins, in need of more cellar time. Tablas Creek 2011 “Patelin de Tablas Blanc,” Paso Robles. 45% Grenache Blanc, 34% Viognier, 18% Roussanne, 3% Marsanne, fermented in stainless steel. Light straw color, with apple and stone fruit aromas together with floral and leesy notes. Medium-light weight, with a crisp finish. Tablas Creek 2010 “Côtes de Tablas Blanc,” Estate, Paso Robles. 54% Viognier, 30% Grenache Blanc, 8% Marsanne, 8% Roussanne, fermented in stainless steel. Light color, this showed more citrus character than the “Patelin,” along with floral, earth, and mineral components. Somewhat richer texture than the “Patelin” with a smoother finish. Tablas Creek 2010 Roussanne, Estate, Paso Robles. 100% Roussanne, fermented in larger oak vessels. Medium-yellow color, showing stone fruit, lees, and a touch of honey. Medium weight on the palate, with a smooth finish. This seems like it will need time to develop. Tablas Creek 2010 “Esprit de Beaucastel Blanc,” Estate, Paso Robles.60% Roussanne, 35% Grenache Blanc, 5% Picpoul Blanc. Medium-light color, displaying aromas of pear, minerals, lees, and spice. Moderately rich mouthfeel but very good balance and a chalky, minerally finish, nice. Tablas Creek 2011 Vermentino, Estate, Paso Robles. 100% Vermentino, fermented in stainless steel. Light straw color, this featured pear and melon along with a minerally note. Medium-bodied with crisp acidity and a lively finish. Tablas Creek 2011 Rosé, Estate, Paso Robles.58% Mourvèdre, 30% Grenache, 12% Counoise. Very light pink, with somewhat shy aromas that were more savory and herbal than fruit-forward. Medium-light bodied, this had a touch of tannin on the finish. Tablas Creek 2011 “Patelin de Tablas,” Paso Robles.52% Syrah, 29% Grenache, 18% Mourvèdre, 1% Counoise. Medium color, with pretty floral aromas along with black cherry and plum fruit, minerals, and a touch of spice. Medium weight with a lively texture and milder tannins. More complexity and interest than most wines at this price, very nice. Tablas Creek 2010 “Côtes de Tablas,” Estate, Paso Robles. 46% Grenache, 39% Syrah, 10% Mourvèdre, 5% Counoise. Medium purple, this showed both brighter red fruits and a more earthy character than the “Patelin.” Somewhat bigger texture than the “Patelin” with more structure and grippier tannins. Tablas Creek 2010, Mourvèdre, Estate, Paso Robles. 100% Mourvèdre. Medium-dark color, less fruit-forward aromas with more earth, herbs, and funk along with plum and currant fruit. Bigger mouthfeel with firm tannins on the finish. Tablas Creek 2010 “Esprit de Beaucastel,” Paso Robles.45% Mourvèdre, 30% Syrah, 21% Grenache, 4% Counoise. Medium-dark color, displaying both red and black fruits, earth, minerals, herbs, and a slightly floral note. Medium-full bodied with plenty of structure, with big but not harsh tannins. Nice complexity, and probably the best “Esprit” bottling I’ve tried in several years. Comments: Jason Haas and Darren Delmore were behind the Tablas Creek table, and Al and I tasted through most of their wines, which were impressive as usual. Ten Acre 2011 Chardonnay, Santa Lucia Highlands. Light color, fruit forward with stone fruit and tropical fruit notes and spice. Medium-bodied, tasty but fairly simple. Ten Acre 2010 Chardonnay, Green Acre Hills Vineyard, Sonoma Coast. Medium-light straw color, this displayed more apply fruit along with baking spice and vanilla/oak on the nose. Bigger texture on the palate than the SLH bottling, this had a pleasant finish. Ten Acre 2010 Pinot Noir, Sonoma Coast. 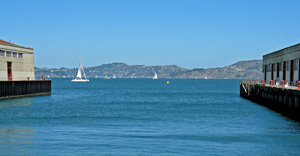 Vineyard sources include DuNah and Sangiacomo vineyards. Medium-light color, with black cherry fruit and savory, herbal components plus undertones of spicy oak. Medium-bodied and fairly lively, finishing with lighter tannins. Ten Acre 2010 Pinot Noir, Cummings Vineyard, Russian River Valley. Medium color, this showed more vanilla/oak along with black cherry, plum, and spice. Richer on the palate but with good acidity, this had a moderately tannic finish. Ten Acre 2010 Pinot Noir, Jenkins Vineyard, Russian River Valley. Medium ruby color, with riper black cherry, herbs, and oak on the nose. Medium-rich texture with more structure, and a fairly long finish, nice. Tercero 2011 Viognier, White Hawk Vineyard, Santa Barbara County.Made mostly in neutral oak plus a little in stainless steel. Light straw color, with citrus and nectarine aromas plus a slightly leesy note. Creamy mouthfeel but lighter-bodied, this had a crisp, fresh finish, nice. Tercero 2011 Grenache Blanc, Camp 4 Vineyard, Santa Ynez Valley. Light color, with green apple and a touch of lemon zest on the nose. More weight than the Viognier but bright and lively on the palate and finish. Tercero 2011 Mourvèdre Rosé, Santa Barbara County.About 80% Mourvèdre and 20% Grenache. Light pink color, with earth and herb aromas upfront followed by higher-toned cherry fruit. Medium-light bodied, this finished fairly smooth. Tercero 2008 “Cuvée Christie,” Santa Barbara County.75% Syrah, 12.5% Grenache, 12.5% Mourvèdre, from Larner, Thompson, Camp 4, and Watch Hill vineyards. Medium purple color, showing earth, higher-toned plum and darker fruit, and a touch of vanilla/oak. Medium-big on the palate, this finished with moderate tannins. Tercero 2009 Mourvèdre, Camp 4 Vineyard, Santa Ynez Valley.100% Mourvèdre, aged for 30 months in neutral oak. Medium-dark color, this featured earth, smoke, herbs, and plum aromas. Big and fairly rich in the mouth, with a grippy tannic finish. Tercero 2008 “Cuvée Loco,” Larner Vineyard, Santa Ynez Valley.50% Grenache, 50% Syrah, from Larner Vineyard. Medium-dark color, with brighter red and black fruits, minerals, earth, and vanilla/oak. Rich mouthfeel and good structure, with bigger but refined tannins on the finish, nice. Comments: I had tasted a number of the Tercero wines earlier in the year, and I asked owner/winemaker Larry Schaffer to pour some that I hadn’t tried before. The Viognier was my favorite of the new releases. The Winery SF 2011 Sauvignon Blanc, North Coast. Sourced from Lake and Mendocino County fruit. Very light color, showing lightly herbal citrus aromas. Bright mouthfeel with a lively texture and medium finish. The Winery SF 2011 Viognier North Coast. Light color, with somewhat shy aromas of tangerine and spice. Medium-light bodied, this had a smoother mouthfeel and finish. The Winery SF 2011 Pinot Noir, North Coast. Medium-light garnet color, featuring strawberry and rhubarb along with touches of earth and herbs on the nose. A lighter-weight straightforward Pinot with very mild tannins on the finish. The Winery SF 2009 “People’s Blend,” North Coast. A blend featuring Zinfandel, Syrah, Mourvèdre, Cabernet Sauvignon, Malbec, and Petite Sirah. Medium-dark color, this displayed darker fruits, spice, and vanilla/oak. Bigger and more structured in the mouth, finishing with moderately grippy tannins. The Winery SF 2010 Merlot, North Coast. Medium-dark color, with blueberry and plum fruit, fresh herbs, earth, and a touch of spicy oak. Medium-light bodied and lively on the palate, with refined tannins on the finish, nice. Comments: This is a recent label from winemaker Bryan Kane, who also makes VIE and Sol Rouge wines. Well-made basic bottlings, I thought these were a step up from the Winery SF wines poured at last year’s tasting. (Disclosure – I‘ve done some cellar and bottling work for Bryan). Vellum 2011 “White,” Napa Valley. 80% Sauvignon Blanc, 20% Semillon, co-fermented in neutral oak. Very light straw color, showing lightly herbal citrus aromas along with a spicy, leesy note. Moderately creamy texture with good acidity and a lively finish. Vellum 2008 Cabernet Sauvignon, Napa Valley. 77% Cabernet Sauvignon, 15% Petit Verdot, 8% Merlot, about 55% new oak. Dark color, this featured currant, herbs, green olive, and undertones of spice and chocolate. Medium weight on the palate, this had very good structure and refined tannins on the finish, nice. Vellum 2009 “Black,” Napa Valley. 85% Petit Verdot, 15% Cabernet Sauvignon. Dark color, this showed a more minerally character than the Cabernet, along with more pronounced tobacco/dried herb, earth, and a darker fruit profile. More full-bodied in the mouth than the Cab, with plenty of structure for aging and a firmly tannic finish, nice. Comments: This is the second straight year that the Vellum wines have been among my favorite Bordeaux-variety wines at the tasting. Westerhold 2008 Syrah, Bennett Valley. A pre-release look at a special extended barrel-age bottling (39 months). Dark color, with ripe dark fruits, mocha, spice, and vanilla/oak. Big and rich and on the palate, this finished with moderate tannins. Westerhold 2009 Syrah, Bennett Valley. Aged 16 months in barrel. Dark color, this featured less-ripe fruit than the 2008 bottling, along with more savory and earthy notes, a touch of black pepper, plus undertones of sweet oak. Livelier mouthfeel with a bigger structure than the 2008, with a grippy tannic finish. Tasty now, but this will take some cellar time to show its best. Comments: John Westerhold poured his wines, which are made by Russell Bevan. The two wines were very different from one another, and I liked the 2009 bottling in particular.